It’s a delightful story that stands on the dividing line between YA and something younger children would love very much: not my cup of tea – not by a long way – but I must say up front that the feather-like hand with which the story is written, and the amused smile that peeks out of the lines will not fail to reach the book’s younger audience and at the same time captivate the soul of any adult reading it to them, because both elements will speak clearly to the child still lurking inside. My own “inner child” seems to have gone AWOL some time ago, unfortunately, so I could not appreciate the story as it deserved: nonetheless I believe I can recommend it for its intended audience, because it will deliver all of its promises. 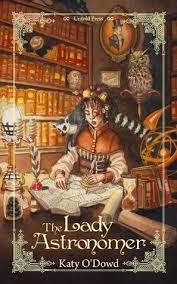 The tone and narrative voice, coupled with the presence of sentient animals and interacting mechanical toys, give The Lady Astronomer the distinct flavor of a bedtime story, one that’s full of wonders like mechanical pigs, suits of armor that act as royal butlers and a set of working dwarves that offer a more than passing wink to the Snow White legend. Unfortunately, the same reasons that make this book a perfect fairytale are the same ones that prevented me from fully enjoying it: first, it’s more like a series of sketches than an organically developed story, and characters are pictured through dialogue rather than examined in depth – and it’s often a dialogue carried in breathless, overlapping sentences, that leave little room to delve to a satisfactory depth into characters, and what makes them tick, so that it was quite difficult for me to form a connection with them as a reader. And then there was my major nitpick, i.e. the author’s choice of using a surname’s initial when mentioning a person: it felt just quirky at first, but then the excessive use of it skirted the middle ground between bothersome and annoying. I understand it might have been the norm for that time period, but to my ears it sounded contrived – and a bit too much. Nonetheless, the story is pleasant and – of course – in the end good triumphs and the evil-doers get their rightful punishment, so if you are looking for a story to read to your kids, one that will leave them with a good feeling, this will be the right choice. 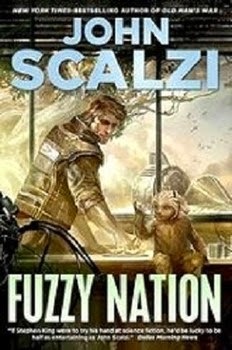 Browsing through the GoodReads list of books I read in 2013, I noticed that one of the authors featuring more prominently is John Scalzi: both his ongoing Old Man’s War series (now counting 5 volumes) and his stand-alone titles never failed to offer entertaining and thoughtful reads. On top of that there’s the person himself: as a follower of his blog I’ve found that he’s a witty, intelligent and considerate person who often takes the time to promote other writers’ work through the recurring series of “Big Idea” posts. 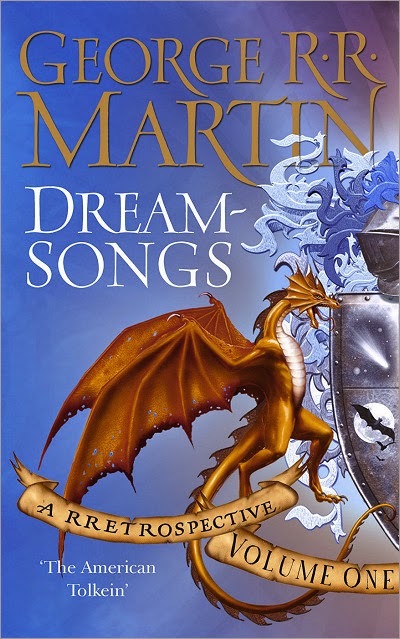 Every time I’ve tried one of those books because the core theme interested me, I made a pleasant discovery (Mary Robinette Kowal being the most notable so far), so that now Mr. Scalzi is not just one of my favorite authors, he’s also a trusted, if indirect, advisor on reading materials. While waiting for his next book to come out, I’ll try to put down some thoughts on what I enjoy about his storytelling. 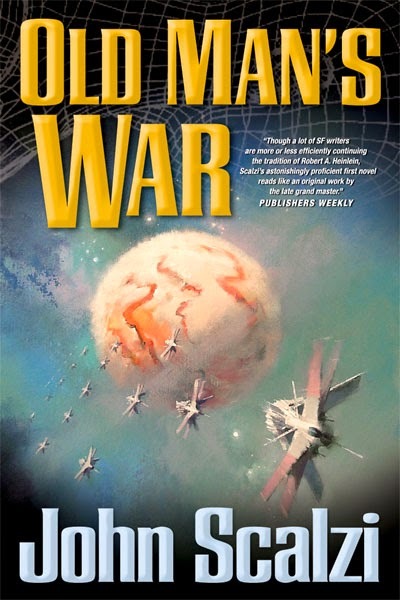 The Old Man’s War series is set in a not-so-distant future in which the elderly are offered, on their 75th birthday, the chance of a new life – literally – serving in the Colonial Union’s military and assisting humanity’s expansion through the galaxy: all this in exchange for a second youth. How this is made possible is something best discovered through reading the books: suffice it to say that it adds an interesting twist to a trope explored in well-known books as Heinlein’s Starship Troopers or Haldeman’s Forever War. The twist comes from the fact that these are mature (and probably wise) people, not adventure-seeking youths, which gives an added layer to their personalities and actions. The storytelling is both light-hearted and thought-provoking, in a delightful balance that is one of Mr. Scalzi’s writing trademarks. The five books written up to today expand on that universe with a true space-opera scope that nonetheless never forgets the human side of living beings – even when they are aliens – giving the reader three-dimensional characters that feel true and believable. This was one of the pleasant surprises I encountered with this series: the militaristic premise of the first book is slowly removed – as if peeling away a camouflage’s layers – to reveal unsavory truths and, more importantly, individual reactions to those truths that allowed me a deeper look into some characters’ personalities. A few of those glimpses moved me deeply more than once, and further raised my appreciation for Mr. Scalzi’s way of dealing with important issues in a deceptively light and offhand way. What’s more, it looks as if the first book will be soon turned into a movie: I can hardly wait to see how it will translate on screen. 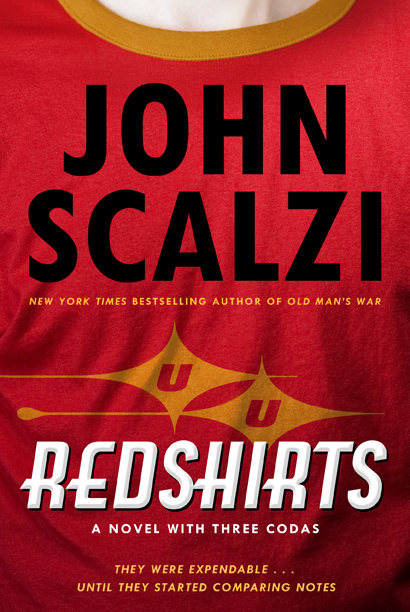 Redshirts is a stand-alone book, one that won the 2013 Hugo Award by the way. It pokes some well-written fun at one of Star Trek‘s most recognized tropes: if you’re part of the security or technical crew (i.e. you’re wearing a red shirt) your life expectations don’t amount to much… The junior officers aboard the Universal Union’s starship Intrepid have come to a frightening realization: every time one of them goes on an away mission with the high-ranking officers, it’s certain that he or she will die in a horrible way. Most of those in the know do their utmost to avoid crossing the officers’ path and therefore being chosen for a team, but a group of newcomers understands there is a deeper reason behind what’s happening: I’m offering no spoilers here, except by saying that it’s a tongue-in-cheek joke aimed at serial tv. Once the truth has been discovered, the young crew members decide to take the matter into their hands to save their own lives and those of their shipmates. This book has a Galaxy Quest flavor, yet it goes further on in the way it exposes the clichés of a long-standing tv show that sticks to its formulas and is afraid to “explore the strange new worlds” it’s supposed to. The author John Scalzi was creative consultant on the set of “Stargate Universe”, the short-lived spinoff of the SG franchise: it’s no mystery that many of the die-hard fans of SG1 did not embrace SGU because it was “too different”, “too dark”. Because – and here I’m expressing my own opinion – it left the beaten (safe?) path to try and find new ways to tell a story. When some of the Redshirts characters face the person responsible for their destinies they ask him if he can’t find a better way of reaching his goals, one that does not require the death of throw-away people. Because a good story, more often than not, comes from the exploration of the unexpected, from a bold move in a new direction. That move might even require the death of a character, but that death must have meaning – this is what the young crewmembers are asking: thoughtfulness and respect, which is what every character in a story – any story – should receive. Despite the humor peppering the pages, and the many hilarious in-jokes, there is a current of seriousness that runs beneath the surface because the story expands to explore more serious territory, as questions about what it means to be alive, and the meaning of life itself, assert their presence – especially in the three delightful and unexpected “codas” at the end of the book. Fuzzy Nation is another stand-alone story, featuring a planetary prospector who discovers the proof of intelligent life on a planet whose resources are being drained by human greed. The story itself concerns a classic trope: the big, bad corporation working to exploit a planet’s resources and trying to ignore the existence of a sentient indigenous race, so that the controlling authorities will not stop them. Of course the trope also requires a brave hero who will defy the big, bad corporation and win against all odds. The way John Scalzi deals with this story makes all the difference, though: with his usual humorous and carefree style he manages to present the situation without falling into clichés, so that the tale remains consistently entertaining, engrossing and delightful. For starters, the indigenous sentients – the Fuzzies – are not simply cute creatures: they are built, page after page, toward a surprise revelation that defies any reader expectation. Their antics, in the course of the novel, are thoroughly entertaining and I found myself laughing out loud in more than one occasion. The hero himself, Jack Halloway, is hardly hero material at all: he’s more of a rogue watching out for his best interests, and even when he sides with the Fuzzies he does so with an eye to his advantages as well. Which makes him very human, and therefore even more likable, as are secondary characters Isabel (Halloway ex-girlfriend) and her new fiancée. These three often engage in delightful verbal sparring that is reminiscent of comedy movies from the ’50s and ’60s and livens up an already sparkling tale. A special mention should go to Carl, Halloway’s dog, trained detonator of explosives and wonderful comic relief, both on his own and in the company of the Fuzzies. Even if you’re not a dog person, you will love Carl without reservations. As I’ve come to expect by now, under the first layer of humorous, entertaining storytelling, Scalzi deals with more serious issues and manages to blend the two sides of the equation in a seamless way, at the same time keeping his readers interested and involved. The pace is quick, the characters believable and likable, the story engrossing: I could not have asked for better. 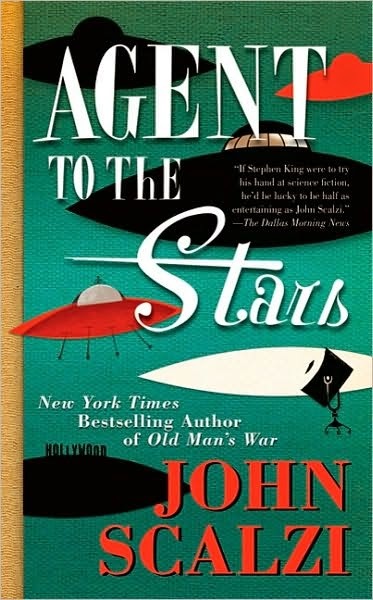 Agent to the Stars: John Scalzi’s very first novel, a work that was a sort of challenge to himself, to see if he could. Granted, it’s not on the same level as his other books, and yet the seeds of his narrative style are all there. It’s another light and funny story about aliens – nice ones – who want to meet Earth people but are aware that their appearance might work against them, so they employ a Hollywood agent to promote their image. Delightful, entertaining and surprisingly deep as well. 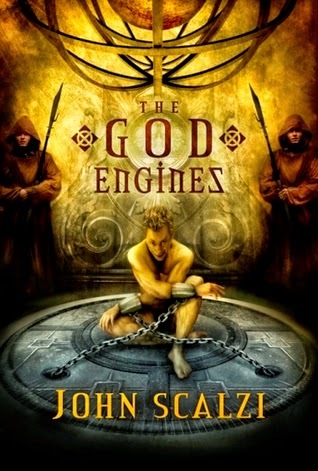 The God Engines: this is a strange story indeed, quite unlike the usual pace and tone I’ve come to expect from the author. First the genre, that is a curious mix of science fantasy with a dash of “magic” (for want of a better word); then the mood, quite dark and unrelieved by the characteristic wit I’ve become accustomed to with Scalzi’s writing. And last but not least the abrupt and scary ending, that left me very unsettled. Unexpected. That’s the first definition that comes to mind about this book, the second in Peter Brett’s Demon Cycle. The surprise comes from the sudden change of focus from Arlen and Co. (last seen shortly after the bloody victory against a coreling horde) to the Krasian army led by Jardir, intent on conquering the world as the reborn Deliverer. In a series of flashbacks, broken by present-day narrative, Brett gives us Jardir’s life story and his path toward supreme rule of the Krasians, with a new angle on the moment when he comes in possession of the warded spear he stole from Arlen in the previous book. What’s interesting is that this specific act – while still heinous – is put into a wider context with Jardir’s past and present: even though it doesn’t in the least justify the theft and Arlen’s attempted murder, it shows the circumstances surrounding it and the Krasian leader’s feelings as the events are re-enacted, and fills the broader picture with more details. The Krasian way of life is a harsh and cruel one that has no place for mercy or thoughtfulness: unlike their northern counterparts, who hide in abject fear of the night, the Krasians actively seek battle with the enemy, having built a culture that prizes sacrifice and glorious death. Like their distant cousins, though, they are bound for defeat, because of that almost careless waste of resources that reduces their numbers in an inexorable way. Your people live to fight, while mine fight to live – this is how one character sums up the differences between the two peoples: in light of the revelations this book brings to light, it remains to be seen if they will find a middle ground, and through it, a way to beat the enemy. Jardir himself is a source of contradictions, from my point of view: on one hand I can’t form a bond with this character – who is so tightly focused on his desire to create a united front against the demons that for him this end justifies all means, no matter how cruel – but on the other I can see quite clearly where he comes from as a person, how the events in his life, and the people around him (especially his politically shrewd first wife Inevera), come to shape his character, and his destiny. This is the mark of good writing, because it makes me see the persons behind the characters, makes me understand what makes them tick: even though I don’t like Jardir’s methods, I can still care for the way his story goes, and that’s more than enough. A further element that breathes strong life in this second book is the introduction of a new threat with the coreling princes, the real power – mental and physical – behind the demon hordes: as fascinating as it is to discover these creatures and to look at events from their point of view, their appearance means that even the newly discovered wards, and the pro-active stance humanity is slowly taking against the attacks, might not be enough to stem the demonic hordes, let alone vanquish them. These new players are indeed raising the stakes and at the same time showing a different – and more worrisome – aspect in the nightly attacks: what before looked like the work of a mindless army of evil, now appears as a planned campaign, whose outcome looks far from predictable. Once the focus goes back to the previous book’s three heroes, we are introduced to many changes: Leesha’s former home has been turned into a fighters’ village, where everyone’s skills are being honed against the demons; it’s heartening to witness how quickly the people flourish with a little hope and courage, despite the awareness that they, like all the inhabitants of the north, will soon find themselves fighting on two fronts – the Krasian invasion and the nightly corelings’ attacks. As heartening as this vision can be, after witnessing the terror in which this world is plunged night after night, I can’t avoid feeling it’s somewhat forced: the change is too swift, too radical to effectively suspend my disbelief. Leesha herself turns from a convincingly headstrong woman into a super-heroine-of-all-trades: her healing skills work side by side with exceptional warding abilities and the fashioning of new weapons, making her into the de facto leader of the community – all this in the brief space of a few months. 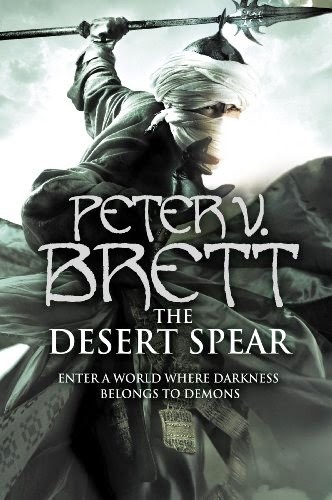 Only Peter Brett’s compelling narrative managed to keep my suspension of disbelief up and running, and in some places it was nonetheless an effort. As fascinating as the world-building is, and continues to be, there are moments when the characterization goes somewhat over the top: Leesha’s path is one such example, compounded by her later girlish fascination with Jardir – all built on secretive glances and blushing cheeks: I surprised myself thinking, time and again, that if old Healer Bruna had been present, she would have brought Leesha’s back to reason with a well-placed blow from her walking stick. Jardir suffers as well: this fearsome warrior, imbued with the moral conviction of being the new Deliverer, falls head-over-heels for Leesha and behaves like a hormone-crazed teenager from their very first encounter, and Inevera – a woman for whom the phrase “political expediency” seems to have been invented – also lapses into uncharacteristic conduct. Nothing major, nor anything that would turn me off the book, granted, but still at the time it read like the betrayal of characters that had been drawn quite well until that moment. All this is however counterbalanced by the narrative thread concerning Arlen and Renna Tanner, who comes on the scene as a full-fledged main character after her swift presentation in the previous book: her harrowing past of violence and abuse gives a solid background to her evolution, and makes her a believable ally/sidekick for Arlen, not least because she acts as a mirror for the dangers inherent in wearing magic wards on your own skin. This is one of the details that I most enjoyed in this story, that the way to battle demons on their own ground requires a price – a steep one: where it will lead some of the players still remains to be seen, and this further uncertainty is a promise for a satisfying continuation in the next book. John Scalzi is among my favorite authors: I have a bigger post in the works where I talk at some length about his books. Meanwhile, this recently released novella introduces the changed world that will be the background of his upcoming book Lock In, and is written as oral history, i.e. through several eyewitnesses’ accounts. The premise: a virulent flu strain sweeps across the globe, killing millions in its wake and leaving an equally impressive number of people prisoners of their own bodies – they are awake, and aware, but incapable of motion, speech, communication. 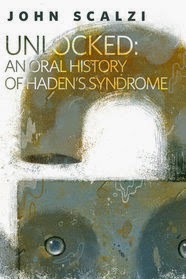 The story gives an account of these events, of the profound social changes brought by Haden’s Syndrome (so named after one of its most illustrious victims, the United States’ First Lady) and of the consequences of mankind’s attempts to deal with the disease’s aftermath. Unlocked represents a dark twist in John Scalzi’s usually lighter-toned writing: even though the alternating eyewitness reports are collected after the fact, therefore getting some emotional distance from actual events, there is a palpable sense of impending doom, the perception of an unavoidable catastrophe happening before our eyes – a tragedy that both terrifies and fascinates the reader. The stark, journalistic style of the reports does nothing to mitigate the horror of the unfolding drama and at the same time makes it both real and believable because, as we are reminded more than once, no one remains untouched by the disease. It’s impossible, while reading this account, not to think about how realistic this scenario is, how it feels like a news report rather than fiction. It hardly matters whether this flu is a natural evolution of an existing strain or the result of a willful terrorist act, as implied and discussed by several parties: both options are explored, yes, but this is not the focus of the story. What’s really important is how the world reacts to a pandemic of these proportions and to the huge problem of the uncounted victims of the final stage of the infection, the one that leaves them helpless, locked in their bodies without access to the external world. After the initial shock, the world starts to recover and to move pro-actively toward a solution for the Hadens – the collective name given to the lock-in-syndrome casualties. That solution will most certainly be the core theme of the upcoming book, so I’m not going into any spoilers here: suffice it to say that the small glimpses we are given about the social ramification of it (both short- and long-term ones) and the changes in public awareness, will allow Lock-In an in-depth point of view on disability, social standing and human rights. There are many advantages for writers when offering free samples of their fiction on a website: the most obvious one is that a potential reader can get a clear idea about style, genre and writing quality from those short glimpses into an author’s craft – and of course that same reader can discover new books or a new genre he/she never approached before. On top of that, the writer can expand on an already-established world, shedding more light on situations, or characters, that did not get enough exposure in previous books. What Seanan McGuire does, besides all that, is open a door for new characters that might find their way into existing series, or start new ones: this is exactly what happens in this short story, set into the Incryptid universe and introducing Rose Marshall, the protagonist of her upcoming book Sparrow Hill Road. Verity Price, the heroine of the first two Incryptid books, is on a long, roundabout journey toward her family’s home where she’s taking her fiancé Dominic to meet her parents. Since Dominic used to be a Covenant operative – which means he hunted the cryptids that Verity’s family tries to protect – she wants to make matters easier by having Dominic meet other relatives first. And who better than her aunt Rose, ghostly hitchhiker? 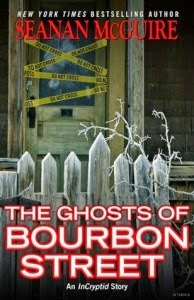 Threaded by the tongue-in-cheek humor that is this series’ trademark, The Ghosts of Bourbon Street takes us to New Orleans on Mardi Gras, on a journey through a city that’s only visible to those who walk with ghosts, a parallel world with its own rules, laws and – of course – dangers. Rose immediately appealed to me: tough, street-smart, sharp-tongued, she’s a perfect addition to McGuire’s parade of strong female characters, one I look forward to knowing better when her book will be available. As for Verity and Dominic, it was fun to meet them again – I confess I missed them both in Book 3, where Verity’s brother took center stage – and the quick cameo from the Aeslin mice was a very welcome surprise. The interplay between matter-of-fact Verity and straightjacket-stiff Dominic made for a few humorous moments, as did the renewed impression that the poor man will need all his inner strength to keep his sanity with the Price family. Hopefully McGuire will show us more along the way. Also… more mice, Ms. McGuire? Prettyplease?